In Blundell Buttons Part I (http://www.advancedaquarist.com/2008/8/lines) I recounted the beginnings of the Blundell Button Project. This article describes how the project has gone, and what unforeseen adventures followed. I started with this coral and fragged off a couple of polyps. These polyps were then given away free to active members in my local aquarium club (Wasatch Marine Aquarium Society). I gave explicit instructions to each person receiving polyps that stated that these corals were to never be sold. They were to be grown, fragged, and shared with others. The new keepers were told that these corals were to be shared only with advanced aquarists who had the best chance of keeping the chain going. These second generation, third generation, forth generation, etc. 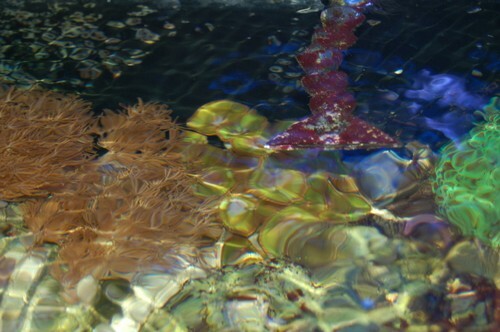 owners were to continue the chain of producing free corals to expert reef keepers. A sort of pass it along free type of project to ensure survival. The new keepers of these corals were to explain to the next person (and so on down the chain) that these corals were to be grown as part of a project to document how well or how poorly corals are aquacultured and distributed. Therefore we wanted everyone to track where the cultured polyps were going from owner to owner down the line. Shown here near the original collection site another colony of Blundell Button’s located and photographed 2 months ago. This process was a huge initial success. I personally fragged many of these polyps and tracked the ownership of them. These new owners did a great job of growing the corals, propagating them, and tracking where they went. But that was about it. It took less than a year to see the difficulties in tracking the coral. Hobbyists move, tanks get changed over, and breaking the chain is quick to happen. This lasted longer than the chain process. For several years (about 4 to my memory) these corals were being fragged for free and given away. At one point a couple hobbyists started asking for $10 per frag. The purpose of this was to “weed out” all the requests and hopefully be left with the serious hobbyists. Unfortunately during the past couple of years this has turned sharply for the worse. 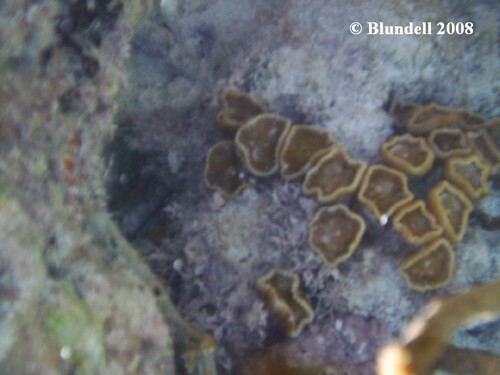 A recent cuil search for “blundell button sale” presented dozens of corals for sale. In fact I was able to find Blundell Buttons for sale on 13 websites, in at least 4 states (origin of all websites was unknown). The price… outrageous (at least in my opinion). 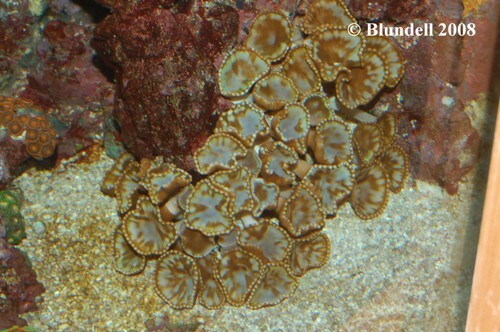 At $50 per polyp on many sites I found this coral atop the list. In fact small colonies were several hundred dollars, which competes with all but the highest of corals. This colony is located in a local fish store and serves as the mother colony for many frags. Shown here the center coral (green and brown) is a fragmented colony for sale. And with eager hobbyists lined up for frags it apparently warrants a high price. This didn’t go so well. How can you say “no” when a hobbyist is willing to give you a couple hundred dollars for a few little frags? With all great intentions of spreading this coral it soon became a game of who had the money. Within my local club this wasn’t difficult for the first few years. But as I said before as people left the hobby their corals were divvied out and often became dead ends in the record books. As of now, I can only physically track but a few specific frags which have endured the past decade. I think it is worth while to tell a little story here. Earlier this year I attended the Midwest Frag Fest in Rockford Illinois. Side note- fabulous event, I highly recommend you attend as the club members work very well together to make this successful. During this event I found a hobbyist selling “Blundell Buttons.” They were well labeled and prominently displayed, but no price was listed on the tank. 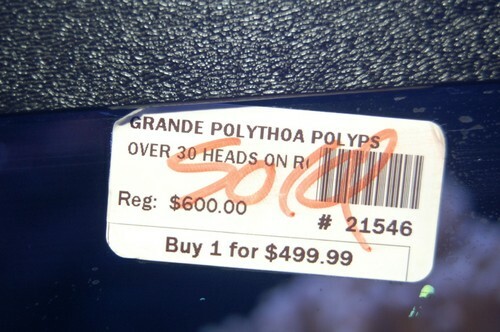 I asked how much, and was told they are $10 per polyp (mind you that is less than half what they sell for back home to me). I then asked the hobbyist “why are they called Blundell Buttons?” The response was all too entertaining. At no time during this conversation did the hobbyist notice my giant nametag hanging around my neck. Anyway, he said something like “Oh I think they were named by Steve Tyree as one of those limited edition corals.” An answer I’ll have to share with Steve Tyree the next time I see him. 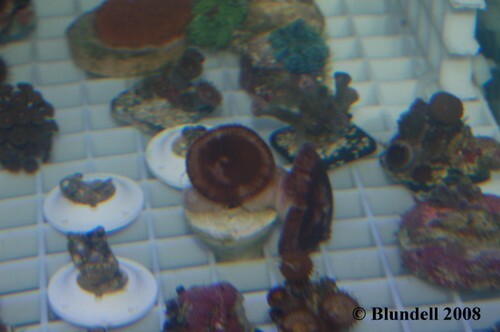 Shown here a couple Blundell Button polyps are displayed for sale at a large aquarium conference (the Midwest Frag Fest). Here is the real story. Adam was doing some “research” in the Caribbean. When he came home Marzena said “Adam, you smell really bad”. Which was understandable seeing how Adam hadn’t changed his clothes or taken a shower for the entire trip. Adam headed directly to the shower. When he was removing his swimming trunks he noticed something in his pocket. He pulled it out and it was still alive (barely). Luckily his shorts didn’t have those little holes in the bottom of the pockets to drain the sea water out of them. Adam quick threw the animal in the nearest aquarium and to his amazement it lived. He quickly began selling this coral to the members of the club as a cure to everything that ails your aquarium (ich, velvet, Aiptasia). He started with the low price of $1000 and named them “Blundell Buttons” Although it really didn’t cure anything many people in the club were now stuck with this coral and out $1000. In order to recoupe their money they have been propagating and selling this coral (for a nominal fee) for many years. I heard you were in a science lab doing some research on some green button palys when you had an overwhelming sensation of hunger come upon you. The only thing that was in your reach were the green buttons. You took a monster bite out the buttons and quickly realized that it wasn’t a 24oz T-bone. You put the buttons back in the holding tank. As the the Blundell DNA mixed with the green button DNA a new hybrid was formed. The Blundell Button. Just what I heard. How can so many people get the story so wrong? While it is true that this happened in the Carribean, the rest is way off. Not that nomenclature is all that important, but the original name of the coral in question, was actually Magrando Stempornida which in a little known local dialect means Super precious water flower. This beautiful coral used to grace the reefs in abundance until pirates discovered their magical properties and pillaged the natural environment of this precious gem. What few clonies survived the pirates, were then desimated by the untimely tropical storm Geraldo. (who apparently thought Jimmy Hoffa was burried in the reef) The carnage left but one remaining colony in a shallow tidal pool. Until Adam’s trip, locals would arrive semi-annually to pay homage to it and would sprinkle it with phytoplankton in hopes that it would make a come back. While in the Carribean, Adam decided to go on a guided snorkeling tour with a non-English speaking native diving expert ironically named Poshspice. (Ironic because although Adam loves the Spice girls, he’s always had a thing for Scarey Spice). There was an immediate fraternal bond between the two snorklers and they referred to eachother by last name only, as a customary sign of utmost respect. While snorkeling (in his water wings), Blundell was nonchalantly stepping on what would have been ultra rare, Tyree colonies of Acans, Chalices, and Pepto-safecracker-alien eye-toxic-nuclear-rainbow Table Acros for a better look at what was either Hair algea or what used to be the contents of Poshspice’s (last name – Smith) stomach after a long night with Captain Morgan. (again, they simply call it Morgan out of respect) In his excitement, Adam neglected to notice a dime sized jellyfish snuggling up to his forehead. Adam was quite embarrassed when he noticed that all but 3 polyps has been squished beyond recognition. With what dignity he could still muster, he quickly plucked the remaining 3 “Blundell Buttons” and promised to propagate and share (for $750 a polyp) this sacred coral to enthusiasts world wide. Though Poshspice’s village was subsequently destroyed by an unparalleled and unexplainable plague of ravenous Pipefish, we can all now appreciate this beautiful coral in our own homes. In the end, I’m not sure if the project worked. I’m very pleased to see the early documentation of coral fragging. The idea that a coral can be brought into the marketplace and grown and aquacultured for many years has certainly been proven. It does give hope for a sustained “zero impact” hobby. However it is incredibly ironic that a high priced coral has my name attached to it, which is one of the very things I find upsetting in this hobby. And for anyone still wondering – the original colony is still alive and doing well now a nearly a decade later in the original tank. Adam Blundell M.S. is a hobbyist, lecturer, author, teacher, and research biologist. Adam is the director of the Aquatic & Terrestrial Research Team, a group which bridges the gap between hobbyists and scientists. Adam can be reached by email at adamblundell@hotmail.com. Blundell, A., (2006), Personal Communication with Eric Borneman. Salt Lake City, Utah. Blundell, A., (2008), “Blundell Buttons Part I: The Past”, Adavanced Aquarist Online Magazine V:7 I:8, USA. Borneman, E., (2001), “Aquarium Corals: selection, husbandry, and natural history”, TFH Publications. Neptune City, New Jersey. Humann, P., (1993), “Reef Coral Identification”, New World Publications Inc. Jacksonville, Florida. Humann, P., (1992), “Reef Creature Identification”, New World Publications Inc. Jacksonville, Florida. Sprung, J., (1999), “Corals: a quick reference guide”, Ricordea Publishing. Miami, Florida.